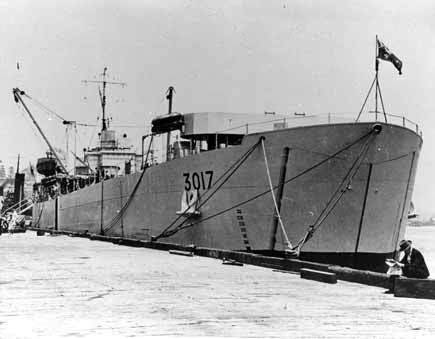 LST 3017 was one of six Landing Ships Tank (Mark 3) which were loaned by the Royal Navy to the Royal Australian Navy in 1946. The others were LSTs 3008, 3014, 3022, 3035 (renamed HMAS Lae) and 3501 (renamed HMAS Labuan). LST 3017 was taken over by the Royal Australian Navy and commissioned at Trincomalee as HMA LST 3017 on 4 July 1946, under the command of Acting Commander George M Dixon DSC RANVR. 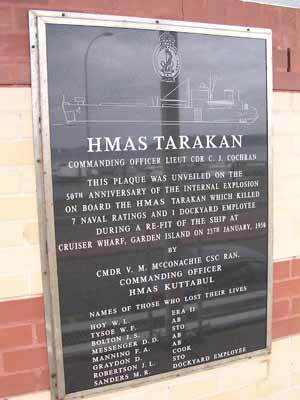 She was renamed Tarakan on 16 December 1948. Tarakan served in Australian and New Guinea waters as a general purpose vessel, but was mainly used for dumping condemned ammunition at sea. On 25 January 1950 she was berthed alongside Garden Island, Sydney, making good defects prior to departure for New Guinea, when an explosion occurred aft under the mess decks, resulting in the deaths of seven sailors and one dockyard tradesman. A further 12 sailors and one dockyard tradesman were injured. The ship was extensively damaged. Tarakan did not return to seagoing service and on 12 March 1954 she was sold on behalf of the United Kingdom Ministry of Transport to EA Marr & Sons Pty Ltd, of Mascot, Sydney, for breaking up.